I can't help going back to my own past when I think about Bully. I don't think I lived in an alternate universe where bullying didn't happen. However, I cannot remember any suicides in my high school or middle school or elementary school years as a result of taunting. Perhaps another time I may offer some Personal Reflections on Bully, but for now, I will stick with the film itself. Bully follows three kids: Alex, 12, from Sioux City, Iowa; Ja'meya, 14, from Yazoo County, Mississippi; and Kelby, 16, from Tuttle, Oklahoma. We also get two other stories: Tyler, 17, from Murray County, Georgia; and Ty Fields-Smalley, 11, from Perkins, OK. We see each of their stories unfold, some of which are shocking beyond belief. Alex appears to be the central figure in Bully. He is not just taunted by others (such as being called 'fish-face' for his physical appearance) but getting threats of violence, culminating in actual acts of violence visited upon him. He tells us and his parents that he's been sat on, chocked, and worse, we see kids on the school bus stab him with pencils. Even more shocking is how he takes it: he tells his father that he thinks someone strangling him is just 'messing around'. Ja'meya's story is more shocking: tired of being ridiculed, she takes a gun on the bus and pulls it on not just her bullies but on everyone else on the bus. Fortunately, no one was hurt but this act required Ja'meya to be locked up while awaiting her fate, facing 22 counts of kidnapping and 22 counts of aggravated assault. Kelby's story is the one focused on least: she is an out lesbian in this small town, a girl who already has a girlfriend and could be mistaken for a man at a quick glance. The stories of Ty and Tyler are simply the saddest. Tyler was 17 when he took his own life, and Ty was only 11. That's not a typo: he was 11 years old when he committed suicide over the taunting he got in school. At that point, I truly wondered whether it is a common trait among people in positions in authority to be so utterly clueless, even slightly divorced from reality. Kids will ALWAYS behave when an authority figure is present. Even I know that, and I can base this on my own experience in school. Did any of you misbehave in the presence of the principal or assistant principal? We end Bully with kids and parents and interested adults at various Stand For the Silent rallies, and a call to action. In this respect, Lee Hirsh's film is like so many other 'documentaries' in that it is really what I call an 'advocacy film', or a feature made for the purpose of asking me to do something. There is nothing wrong with that per se, but it does to my mind stretch the definition of 'documentary': a film that tells us of a something and asks us to make our own mind up. It is, however, difficult to not react emotionally to some of the horror stories one hears and sees in Bully. In particular, Ja'meya's story stuns a viewer in how she took a gun to settle the situation. The horror of it all is compounded by the few minutes where we wonder whether the situation ended with actual violence, even killing. It is also heartbreaking to see from the Longs and Smalleys talk about their dead children. I digress to say that when we finally see a picture of Tyler, I thought he looked like a nice boy. What is stunning is that an eleven-year-old boy decided that it was better to take his own life rather than continue living with the torment others were inflicting on him. Again, I digress to say that growing up, the idea of killing myself at age 11 was something that would simply not been in my realm of reality. I had never heard of anyone being bullied enough to have killed themselves while in elementary or middle school (or actually even in high school), so the fact that this child took his own life at such a young age leaves you devastated, and seeing Ty's parent's agony is even more horrifying. Bully, however, has some problems. Not all the subjects are given equal time: Kelby's story is almost forgotten (though when she does appear, we can admire her determination to stick it out). A great deal of time is spent on the victims of bullying, but nothing is spoken on the why or how of the bullies themselves. Are the kids who are causing these acts evil, or are they thoughtless, or are they trying to put up a front? I think it would be good to put some attention on how things got so far. Given that a great deal of attention was given to Alex, I did wonder about how he could appear to so not comprehend that the situations were not normal, nor his curious reaction to being told off after he tells someone he was his "buddy". While the high schooler's reaction was one of anger and hostile, I wonder why Alex would engage with someone in this kind of conversation. I can only base this on my own reaction to someone I didn't know or barely knew saying he would be my "buddy" almost randomly. I would be slightly puzzled, but I would respond with a simple, 'thanks but no thanks', not threaten his life. Yet I digress. 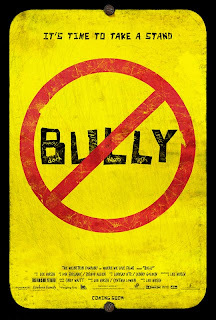 One problem with Bully, apart from not keeping a strong focus on all the children (and sometimes not keeping a focus, literally) and on not attempting to investigate bullying from the perspective of the bully himself or herself is in how the bullying is presented. We are shown a lot of bullying in terms of assaults on Alex, but nothing with Kelby, or getting a stronger picture of how Ja'meya was so driven to this point. I wonder if speaking to those on the bus, to see how it all culminated into something so shocking, would have made Bully into a stronger film. Ultimately, Bully is a good film that makes one question, not so much why there is bullying or even whether is has grown to this epidemic that it is being presented as, but why so many kids who neither bully or are bullied can remain silent when they see this. No one, not even the bus driver, came to Alex's defense as he is being stabbed and pushed around. It is the passivity of the others, more than the actions of the minority or the inability of those assaulted to stand up for themselves, that is the real shock in Bully. Actually, that and the inability of grown adults to stop acts of violence against and by their own children that is shocking. I Survived. I Lived to Tell the Tale. You Will Too. We all do, perhaps slightly damaged, but in the end, we can do nothing more but survive and keep going. All who are bullied can come out of those years. It's a tough subject, one that should be covered, and Bully is a good start to the conversation.